Today's So Shoe Me is the Gemma in Black by YRU, $115, available at Solestruck. 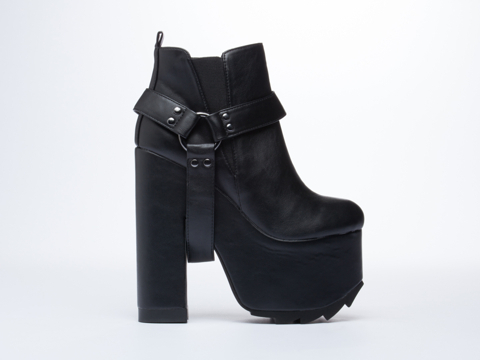 Stomp up your solecial status with these heavy heeled harness boots by YRU. A moster sized platform and heavy duty harness create the perfect all-weather boot for summer. The treaded sole makes it easy to walk wherever your trail takes you and the elastic side vents offer blister-free comfort. Pair these strapped sky high heels with a high-waisted harness skirt, tie dye crop top and feather puff earrings for a 90s street wear style to wear day or night. So Shoe Me a pair of all-black harness boots that will add a heavy soled silhouette into my everyday style.